The long pastern bone is located between the fetlock and pastern joint. The long pastern bone should be about one-third the length of the cannon bone. The function of the long pastern bone is to increase the flexibility of the fetlock joint and reduce concussion. The length, flexibility, and slope of the pasterns strongly influence the smoothness of the horse's gait. The short pastern bone is located between the long pastern bone and the coffin bone. 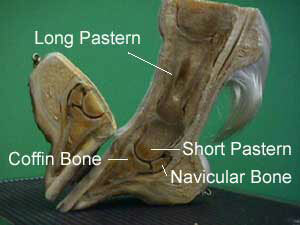 It is also one of the bones that makes up the coffin joint in the hoof. About one-half of the short pastern is located in the hoof. The rounded ends of the short pastern bone allow the hoof to twist or move from side to side to adjust to uneven ground. The navicular bone is located between and underneath the short pastern bone and the coffin bone. The navicular bone is boat-shaped and is relatively thin, with limited blood supply. The navicular bone functions as a fulcrum for the deep flexor tendon that passes underneath it and attaches to the coffin bone. The coffin bone is completely encased in the hoof. The shape of the hoof is determined by the shape of the coffin bone. A front foot will have a rounded, flattened, and wide coffin bone, whereas a back foot will have a pointed, comparatively steep, and narrow coffin bone. The rounded toe allows the horse to break over in the center of the toe. The narrow hind hoof allows the horse to turn easily from side to side. The function of the coffin bone is to provide for the attachment of the deep digital flexor tendon and protection of blood vessels and nerves.